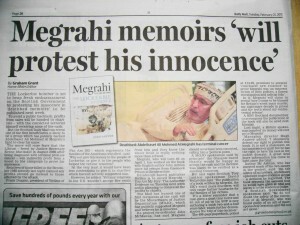 Today’s Daily Mail, carries an article by Graham Grant, headlined Megrahi’s memoirs ‘will protest his innocence’. The article is below in italics, with my comments in normal typeface. The Lockerbie bomber is set to heap fresh embarrassment on the Scottish Government by protesting his innocence in ‘deathbed memoirs’ to be published next week. The book should certainly embarrass the government, or, at least the Crown Office. To avoid a public backlash, profits from sales will be handed to charities – with the convicted terrorist himself receiving none of the cash. However, it has emerged that one of the first beneficiaries is likely to be a group which has publicly backed Abdelbaset Ali Mohmed Al Megrahi’s fight to clear his name. MOJO Scotland has indeed publicly backed Abdelbaset, however, since there is another group that campaigns on his behalf, Justice for Megrahi, MOJO Scotland does not actively campaign for him. Much of its focus is on helping wrongly convicted former prisoners. The move will raise fears that the Libyan – freed by Justice Secretary Kenny MacAskill in August 2009 after being diagnosed with terminal prostate cancer – will indirectly profit from a boost to the campaign to prove his innocence. Relatives of those killed in the December 1988 atrocity last night claimed any profits should go instead to those affected by the attack. Frank Duggan, president of Victims of Pan Am 103 – which represents the families of the Americans who died – said: ‘Why not give this money to the people of Lockerbie, or give it to the people who helped the victims’ relatives? There are two things that readers should know about Frank Duggan. Firstly, he did not lose anyone in the bombing, rather he is a Republican activist and Washington lobbyist. Secondly, when, in August last year, CNN filmed Abdelbaset ill in bed at home, Duggan said he didn’t believe it and was certain that he was with Gadafy. Presumably, along with Elvis and Lord Lucan. As for the fraud allegation, Duggan’s powers of clairvoyance are clearly, once again, failing him. If he had read the book, he would know that almost all of the evidence it contains was assembled by the police and the Crown. Unfortunately for Abdelbaset, and those who wish to know the truth about Lockerbie, it was not revealed at his trial. Megrahi, who will turn 60 on April 1, has worked on the book with English author John Ashton since his release from Greenock Prison in Renfrewshire. Edinburgh-based publisher Birlinn is to unveil Megrahi – You Are My Jury: The Lockerbie Evidence on Tuesday next week and is planning to donate all the profits to charity. A MOJO spokesman said ‘in principle’ the Glasgow-based charity would be happy to accept the cash and the decision was likely to be ratified at a meeting tomorrow. No Scottish politician has a more neandertal approach to Megahi’s case than David ‘Taxi for Mr’ McLetchie. As he should know, because it’s a matter of record, Abdelbaset did not author the book, I did. My recent correspondence with him can be read here and here. The 496-page paperback, priced at £14.99, promises to present ‘conclusive new evidence’ to prove Megrahi was ‘an innocent victim of dirty politics, a flawed investigation and judicial folly’. 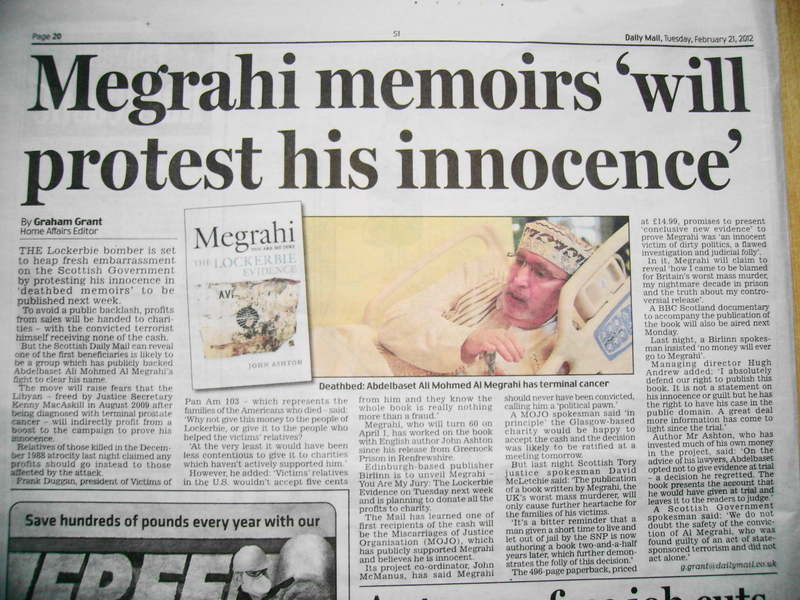 In it, Megrahi will claim to reveal ‘how I came to be blamed for Britain’s worst mass murder, my nightmare decade in prison and the truth about my controversial release’. My investment in the project has been two and a half years of unpaid labour. Which conveniently ignores the fact that the Scottish Criminal Cases Review Commission referred the case back to the appeal court on no fewer than six grounds, one of which was that the trial court judgment was unreasonable.